2Checkout.com, Inc. is an authorized retailer of Tomahawk Press. When you hear the words “Hammer Films”, you instantly conjure up mental images of monsters and vampires. Behind the scenes was one man working flat out to produce those wonderful creatures. That man was Roy Ashton, and it was he who created all of the make-up effects for mummies, werewolves and Gothic horrors. Greasepaint and Gore takes a look into the props wardrobe and make up unit where Ashton, long before computer technology existed, created his own high standards of magical illusions. When Roy passed away in 1995, the authors began to collect his impressive series of preparatory sketches and have married these up with studio shots of the completed article as well as rare pictures of their subject busy at work. This is a remarkable collection and it is appropriate that there is a permanent home to the Roy Ashton Collection at the National Museum of Photography Film and Television. The Museum’s acquisition of this important work was the first time ever that National Lottery money had been spent on film heritage. With an introduction from the late Peter Cushing OBE, who had the opportunity to watch Roy Ashton at work countless times (after all make-up can also make you look glamorous as well as horrific), this is a demonstration of a true professional at work. 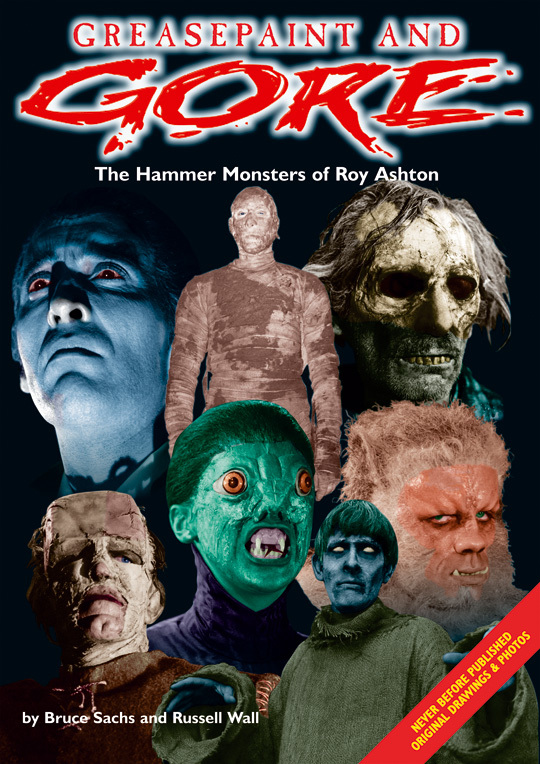 Greasepaint and Gore catalogues the largest single collection of Hammer production artefacts in existence, and is a must have for any horror… or indeed any film fan!